If the presidential election were held today, Hillary Clinton would top Donald Trump 320-212 in electoral votes to clinch the White House, according to an extensive Morning Consult analysis of 57,000 voters. That electoral count is only slightly less favorable to Democrats than the count in the 2012 election, when President Obama won the Electoral College 332-206. The 2016 presidential race is far from over, however. Morning Consult’s polling data is within 2 percentage points in eight key states. Iowa is not included in the electoral count because it is a statistical dead heat. The other close states are Florida, Georgia, Maine, Michigan, New Hampshire, Ohio, Pennsylvania, and Wisconsin. When those states are removed from the electoral count, Clinton garners 241 electoral votes and Trump receives 190. If Trump wins a few of those states, he could come out on top. The analysis uses the opinions of 57,000 registered voters collected from April through June in tandem with a variety of demographic characteristics in each state, such as age, gender, and President Obama’s approval rating, to determine how the race would look now. 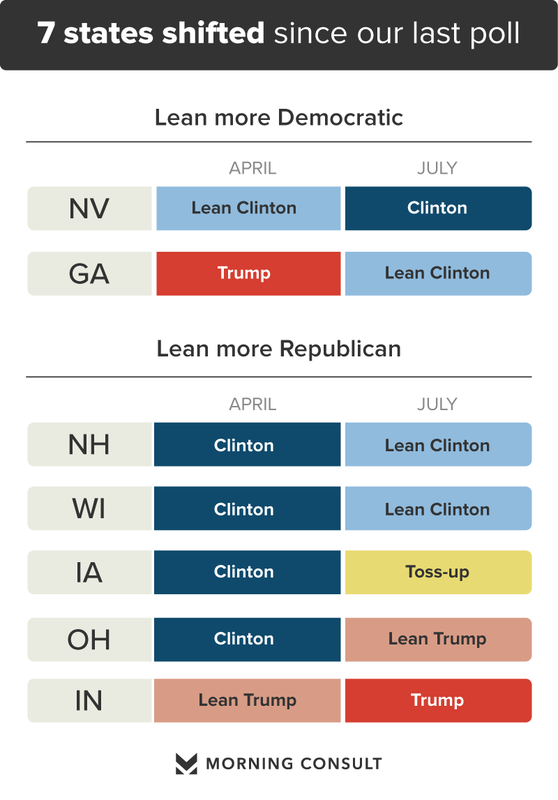 The research shows movement in a number of states since Morning Consult’s previous in-depth analysis. In the Midwest, Trump is gaining ground. In April, Clinton led Trump by 2 percentage points in Ohio, but now the Buckeye State leans toward the GOP nominee. Clinton also earlier held a slim lead in Iowa, but that race is now a pure tossup, with both candidates receiving 40.1 percent of the vote. Wisconsin is also trending toward Trump. In Indiana, Trump has made major gains against Clinton; he has increased his lead there by 9 percentage points. In the West, Nevada has moved to the left as the general-election phase of the campaign has kicked into gear. And while much of the map in the South looks typically Republican, Georgia is shifting toward Clinton, where voters were firmly in Trump’s camp in April. The state now leans toward the former secretary of State, albeit within the margin of error. How did we get these results? Our team used a methodology known as multi-level regression and poststratification to crunch responses from more than 57,000 registered voters with state-level demographics such as gender, income and education level. See more on our methodology here.